Catglobe offers four report types which will be adjusted for your specific project. Create professional reporting portals with great flexibility. Access management allow you to decide which data different users should see. Use table sets to gain a quick overview of your data. Select the variables you wish to examine, or use scripting to generate them automatically. Catglobe allows you to edit your data after exporting it to PowerPoint. It is a great tool for visual presentation. Use Catglobe to provide raw data if you wish to process it yourself. We can deliver raw data in Excel, SPSS, CSV etc. 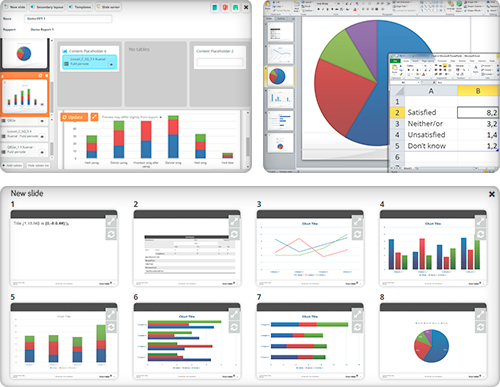 Present results using your company’s graphic expression in PowerPoint. You are not only exporting pictures, but all the data will be directly exported into PowerPoint. Therefore, you can easily continue working with the data and make any desired visual adjustments. It has never been more easy and convenient to work with data after the data collection. you don’t have to start over.